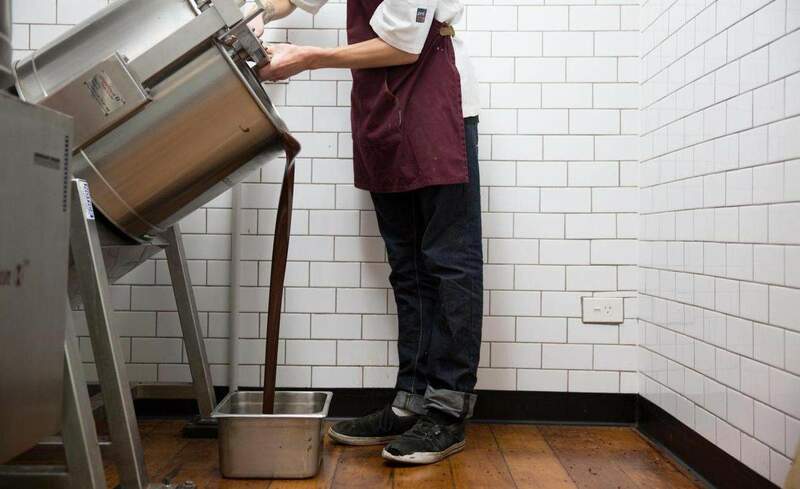 New Zealand’s first beans-to-bar chocolate factory. At the end of an unsuspecting alleyway lies the El Dorado of Wellington’s chocolate scene. This establishment is emperor among chocolate vendors, and well worth a visit to quench those cocoa cravings. Co-founded by Gabe Davidson and Rochelle Harrison in a transformed warehouse, the Wellington Chocolate Factory is New Zealand’s first beans-to-bar chocolate factory, providing a full chocolate experience for all of Wellington’s cocoa aficionados (or for anyone who likes to bask in the smells, sights and sounds of chocolate in every stage of its manufacture – i.e. everyone). A passion for high-quality, organic ingredients and a strong belief in fair trade principles drives the company. Beans are sourced from Peru, the Dominican Republic, Trinadad Tabago and Madagascar, and a relationship is maintained with the farmers who produce them. The beans are then processed using artisan methods dating back to the 18th century. The resulting 70% coca and 30% sugar chocolate is infused with innovative and distinct flavours, and packaged in unique wrappers designed by New Zealand artists such as Simon Morse, Gina Kiel and Malarky. The Wellington Chocolate Factory is equipped to satiate chocolate hungers with more than just solids alone; their hot chocolates are some of the finest in the city. This chocolate nectar is made from single origin, 70 per cent chocolate. It is made solely from ground up chocolate – no extra nasties here. The different flavours on offer (malt and marmalade, apricot, and berry to name a few) come from the natural flavours of the chocolate itself. The result is a rich, smooth, gloopy, warm mouthful of delight.